I can't tell you how long I've wanted to do this story. Actually, I can. Its genesis lies about four minutes into our Versys 650 first ride. At that point it was already becoming obvious how good the Kawasaki was likely to be in our conditions. Two days later, the burning question was whether or not the Kawasaki was the best adventure tourer in the house? Before we go any further though, let us be clear about the term adventure tourer. The moniker starts out with off-road capable motorcycles to be sure. But the fact is that like SUVs, they ain't going off-road by and large. 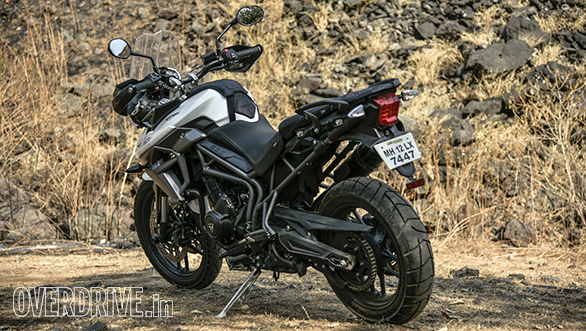 The adventure tourer then is a reasonably large motorcycle which should tour well, commute comfortably and have the wherewithal to handle bouts of light off-roading. As with many other kinds of vehicles, examples abound, the dynamics and requirements of more serious off-roading bring specialised equipment and tuning that may not be good for road use. So, context set? Not quite! There is the matter of the Triumph! The Tiger 800 is a wonderful motorcycle. It makes great power and torque for its class, handles light and easy, has all the bells and whistles you could ask for across a substantial model spread. Amongst its class of bikes, the Tiger has, until recently, been the most affordable as well. It's a hard combination to beat. Or is it? This is the hardest department to call, really. Both bikes are made reasonably well and neither feels flimsy or like it's going to rattle easily. Point to note here also is that neither are exemplary in fit-finish or build. In fact, Triumph has shown a new ability on this front with the careful design and execution of the new Bonnie - the Tiger's turn to receive attention is yet to come. But which of these two is better styled? The twin irregular hexagonal headlamps of the Tiger are distinctive. Our test bike here, an XRx does wear a few choice accessories from Performance Racing like the clear head light shield and the Two Brother's Racing exhaust. But the Tiger has always had this expanse of body work that on my opinion looks better in dark colours than light ones. It has presence, no doubt. But pretty? No. The Versys isn't far removed from this assessment. It gets that predatory bird fairing from the 1000 but scaled down to better proportions. The face is aggressive and angular as recent Kawasakis tend to have. 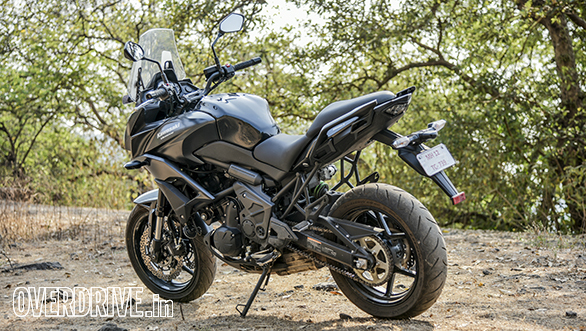 Like the Tiger, the Versys is a large-boned, well-proportioned motorcycle. But pretty? No once more. So take your pick - we're splitting hairs over two striking, big-boned motorcycles. This is where the two bikes are most different from each other. The Triumph uses a 800cc motor created by long-stroking the Street Triple's excellent 675cc engine. It brings 79Nm at 7,850rpm and 95PS at 9,250rpm to the three-cylinder package. The Versys uses a torquier, smoother version of the 649cc parallel twin from the Ninja 650. Peak torque is 64Nm at 7,000rpm and power peaks at 69PS. Of the two the Tiger is more refined. 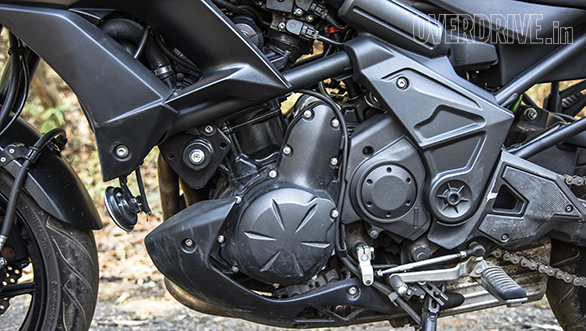 The Versys has a softness to its power delivery that can be misinterpreted as refinement but you'll notice the slight vibration in the pegs that gives the edge to the Triumph. The Triumph is crisp from the off and it matches that to flawless fuel delivery and a nearly complete lack of vibration. What's really impressive about the Tiger isn't the extra shove - which, by the way, is lovely. The Tiger's engine is endlessly flexible. I caught myself riding it in sixth gear like an automatic scooter at anything past 30kmph - two up! That's insane and marvellous. The Versys isn't limp either. It's engine is flexible too but 40kmph in top is the lowest it'll go to without complaint. On the flip side we found the Versys' gearing better for highway work. 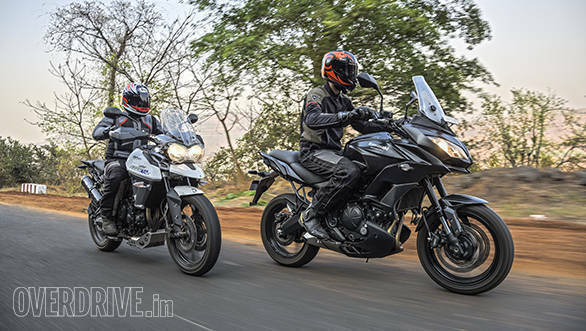 Both bikes are effortless between 80 and 140kmph but the Versys seems to run just a bit smoother and quieter. When you see the numbers, they aren't a surprise. The Tiger is faster and quicker and it's displacement advantage shows. The Versys is behind but not by much. 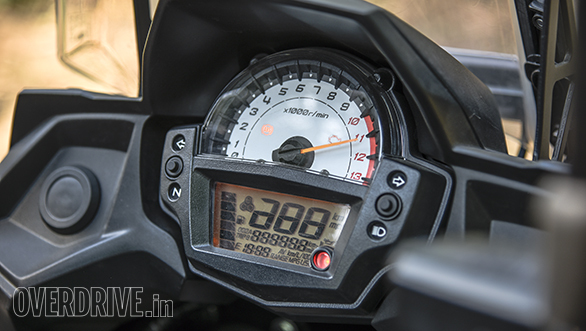 The Kawasaki takes 4.58s to reach 100kmph, while the Tiger takes just 3.81s. You can also spot the Tiger's flexibility. In fourth gear, getting from 40 to 100kmph takes nearly a full second less on the Triumph. The Tiger, just to complete the set, is also over a second and nearly 20kmph quicker over quarter mile. Let's quickly run through the chassis design of both bikes before we dive in to their dynamics. The Tiger uses a steel trellis frame with a non-adjustable 43mm upside down fork offering 180mm travel up front. The monoshock at the back is preload adjustable (needs a screwdriver) and offers 170mm of wheel travel. Twin 308mm front discs stop the bike with a 255mm disc bringing up the rear. ABS is standard and can be turned off. Note that the Tiger XCx/XCA models that offer more off-road ability wear bigger wheels as well as higher spec WP suspension. On the XR (and XRX) you get 19-inch front and 17-inch rear alloy wheels with road rubber - 100/90-19 and 150/70-17. 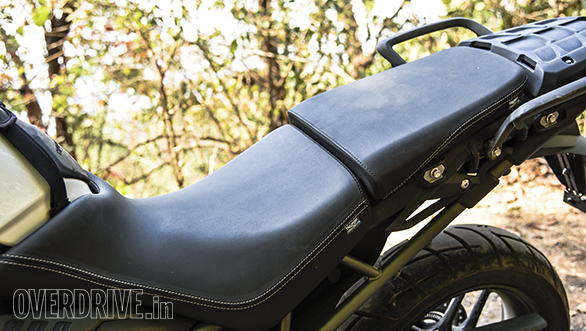 Wet weight is 213kg and the seat height is 20mm adjustable between 810 and 830mm. The Versys uses a "double-pipe diamond tubular steel frame" with its off-set rear monoshock resplendent in Kawasaki green. Offering 145mm of travel, the rear monoshock offers a tools-free remote preload adjuster. Up front are a pair of upside down Showa Separate Function Forks with 150mm of travel and preload and rebound adjustment. The front brakes are dual 300mm discs and the rear is a 250mm single disc. ABS is standard. The tyres are extremely road-oriented. 120/70 and 160/60 road tyres sit on 17-inch alloy wheels. Kerb weight is 216kg and seat height is 840mm. Can you see the pattern emerging? The Tiger offers more travel and less adjustability using its wheel sizes to offer more ability in a wider range of conditions. The Versys narrows focus and is more intent on great on-road performance than any real off-road ability. And yet you'd normally be hard pressed to note that vast a gulf in their abilities when you ride them. The Tiger is eager and agile and it can commute with a vengeance. The Versys is grippy and responsive too but the smaller front wheel makes it feel more secure and you're more likely to push it than the Tiger. The difference in handling is even clearer at the limit. At full lean the Tiger feels vague and distant. The large front wheel subverts feedback and the pegs scrape a bit too early. You quickly find yourself backing off and maintaining a rapid but not flat-out cornering pace - the Tiger makes its displeasure pretty clear. 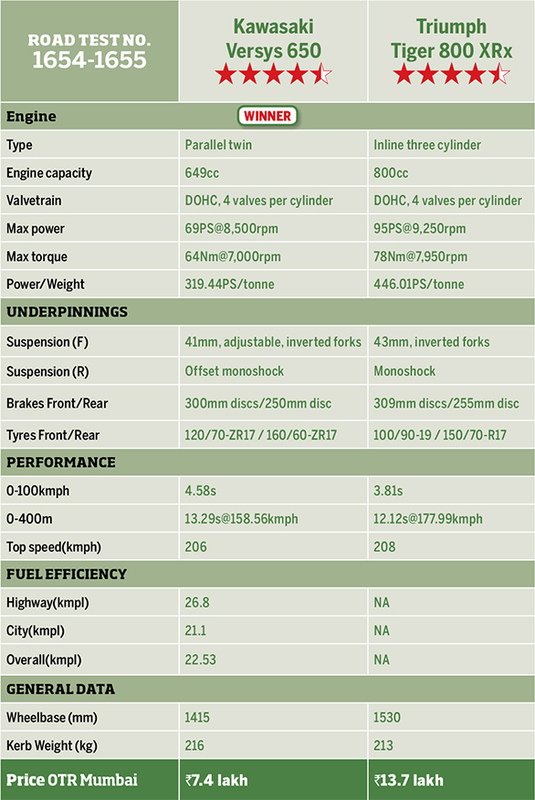 The Versys comes across as a genuine road bike in comparison. It can be pushed quite hard and it'll take full lean cornering happily too. The tall ride height prevents really hard cornering but confidence levels stay sky high. The Versys also has the superior suspension and base setup for road work. There's a marvellous suppleness to the Kawasaki that still amazes me. It makes every single road seem better surfaced and it corners through broken roads with terrific poise. It's this initial suppleness that that the Tiger doesn't have. It feels stiffer. It isn't less capable by any stretch of the imagination. The Triumph takes big hits in its stride and murders the smaller ones. But that silky suppleness of the Versys is missing. I should also note that while the Versys lacks traction control entirely, the Tiger's Triumph Traction Control, TTC, is effective but far from the latest-greatest. Unlike more modern systems, it's interventions are heavy-handed and intrusive. Works? Yes. You'll like it? I think you'll get used to it and learn to live with it. More modern systems intervene with a lot more grace and I'm sure Triumph's newer models will boast more invisible systems. That said, both bikes have exceptional ride quality as well as comfortable seats and upright ergos. Either will handle a steady 10 hour highway slog with nary a bother and they're probably close to, if not actually, the best Indian highway bikes of all right now. Both also have powerful but friendly brakes. Both units are easy to modulate, have nicely tactile initial bite followed a sweet progression. The Tiger, once again, has less bite which allows more control off-road by a small margin. 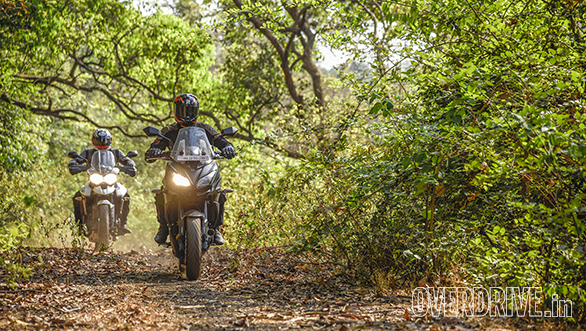 Neither the Tiger XRX nor the Versus 650 are by any means serious off-roaders. The spoke-wheeled XC models can be considered more off-road friendly, an option that doesn't exist on the Versys 650 at all. But both have great ground clearance and long travel suspension so they're not crippled as soon as tarmac ends. The Versys clearly is less happy in the dirt. It isn't hard to understand. It has a slightly top-heavy feel that only becomes obvious when the better balance of the Tiger is at hand for reference. That and the smaller front wheel make off-roading harder work. The Versys feels less sure-footed and progress is made once you accept that slightly loose feel of the chassis. After that the Versys can be hammered along hard or coaxed gently over some pretty gnarly stuff with ease. The Tiger is very different. The bike is beautifully balanced so riding at really, really slow speeds is child's play. The engine's exceptional torque and silky pickup from a closed throttle also make riding it in slow, technical situations very easy. But it's that 19-inch front wheel that really makes its presence felt. 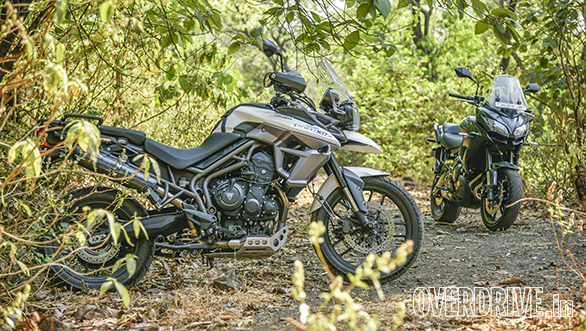 The Tiger feels anchored and centred compared to the looser feel of the Versys and it makes riding it in the dirt far more confident than the larger size-feel of the Tiger should allow. The Versys does have better suspension though. The softer initial tune and the sheer suppleness of the suspension does shine once again post-tarmac. Over broken roads and over trails, the Versys makes stuff feel smooth where the Tiger is more feedbacky. Trouble is, smooth and isolated is not always how you want the contact patches to feel off-road. This one's easy. The Versys' feature list is dramatically short. The instruments show a big tacho and a digital speedo with only the basic information on offer. The Versys doesn't even rate a gear position indicator. 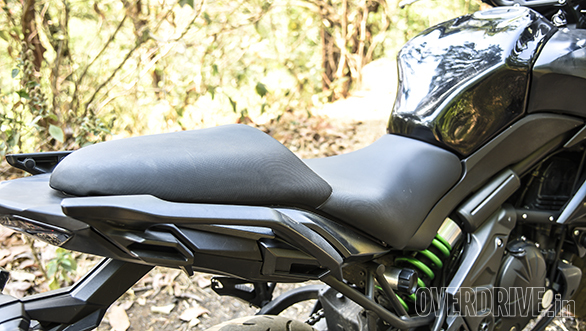 Outside of that, we like the integrated bag-mount points in the grab rail and the fact that unlike the Ninja 650, the Versys has standard ABS. The Tiger by comparison is well loaded. Triumph shares the same speedo unit across many models and that's boring but useful. 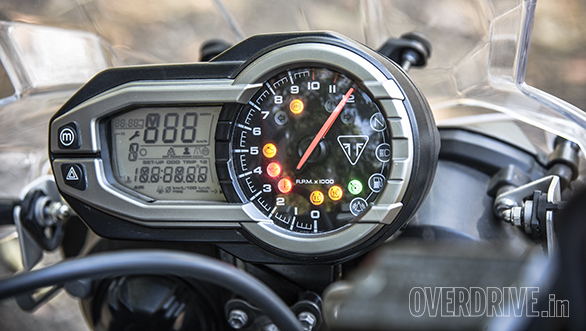 The Tiger's meters are full of features while the rev counter sits on its own and is distraction-free. The XRx has standard ride-by-wire, ABS, riding modes including a custom mode... It's a thoroughly modern spec. The base XR isn't quite so loaded but it does get ABS and traction control. The XRx also rates cruise control, another nod to its touring role. Obviously Kawasaki fans will argue the price difference. And yes, they're right. That's what we have to discuss next! At Rs 12.2 lakh for the XR and Rs 13.7 lakh for the XRx on-road Mumbai, the Triumph is the more expensive motorcycle by a large margin. The Versys is shockingly affordable at Rs 7.4 lakh on-road Mumbai in comparison - and it obviously trades in displacement, performance, technology and features in the bargain. So what should you buy? 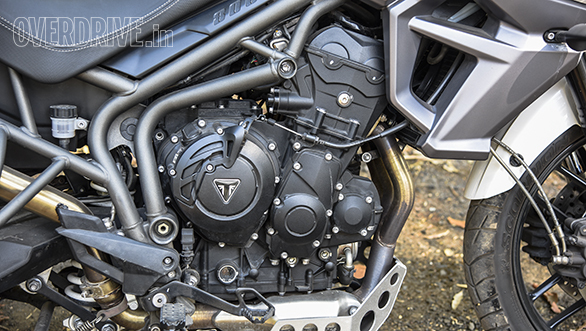 The Tiger is clearly the better motorcycle and not just by virtue of its extra engine performance or electronics. It's a beautifully balanced motorcycle, very effective on the highway, holds it own off-road and Versys aside, it makes all the other adventure tourers look expensive. As we noted earlier, if you do have a penchant for off-road hooning around then consider the XC models which are more oriented towards that role. But the Versys is our winner. It is slower and more road-focused but it's suspension setup allows you to ride harder, ride farther and feel more comfortable. And sometimes all three of those simultaneously. It's a simple motorcycle in the sense that ABS is all it offers by way of electronics but it's more modest power and native friendliness make it easy to get on with even for newer riders. All that ability when considered in the context of its terrific price? The Versys is a no-brainer.